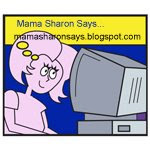 Mama Sharon Says...: Kodak makes it so easy...even for this busy mom! Kodak makes it so easy...even for this busy mom! OK so let me get back to last night. I walked in about 5 or 10 minutes early and was greeted by Mitch Goldstone, the President of ScanMyPhotos, International (pictured with the kiosk) and his wonderful staff. 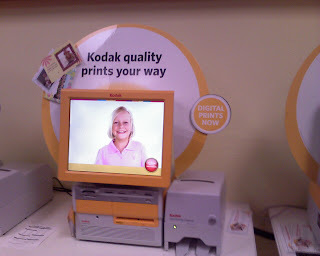 I was brought to a Kodak Kiosk and shown some of the features. Did you know you can download photos from your phone into one of these? Kodak really thought of EVERYTHING! I have to tell you that I was slightly intimidated at first as I think anyone would be when they have no idea what to do. But then I put my USB stick in the port and pressed the “START HERE” button on the screen. Everything is guided by the touch screen which is great. The first thing I created was a DVD with a ton of pictures. And yes, I said the first thing! Mitch and Kodak were quite generous and I was quite grateful. I still am! Anyway, the DVD I made took me all of about 3-5 minutes to make. I selected my photos fo r the disk. I chose photos from the Big Bear trip last year, The Wiggle years, Jonathans past birthdays and Christmas photos. Once the pics were selected I got to go through a bunch of music selections. I chose What I Like About You. Then selected the DONE button and that was that. They processed the DVD for me as I went on to another project. All and all I came home with a poster, a calendar, a DVD, a package of reprints, a couple of 8 ½ x 11 photo collages of my chocolates and browniepops and a photobook! The Photobook took me about 5-10 minutes to make. I don’t know exactly how long because I was having so much fun I totally lost track of time but it really was pretty quick. I should have been looking at the receipts that printed out to let you know how much this stuff would cost on a normal day but I suspect it’s less than you may think. I did look at the receipt for the photobook I created in which I added the max amount of photos allowed. If you’re not sitting down you may want to. It was only about $30. I am so not kidding! I even asked if that was correct. Again, thank you Kodak! Then it was back to the Kiosk. 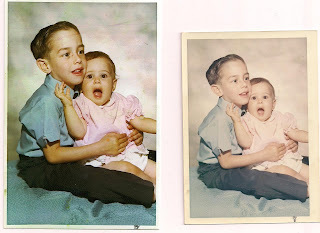 I scanned a photo of mine tha t was of my brother Mike and me when we were very little. The original photo as you can see is faded and well, old. The kiosk has a feature where you can press edit photo and then restore the color. I couldn’t believe my eyes. It was like magic! 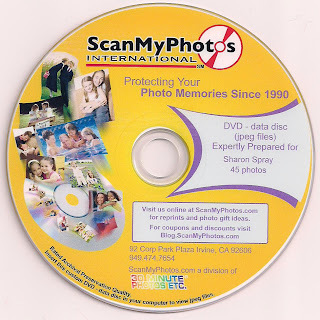 But if you don’t live near ScanMyPhotos then just go online to ScanMyPhotos.com and look for the information on sending your old photos to them and they will send them back with the new and improved versions. I’m not kidding! Hey dad...they will even be able to repair old damaged photos! You can trust them with your treasures. They really know what they’re doing. 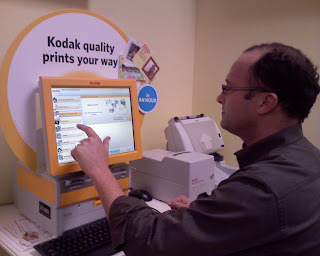 You can also search for a Kodak Kiosk near you by CLICKING HERE. My dad sent me an email this morning, he lives in NY. He said he was going to look for a Kodak Kiosk place in his area. Again, If you want to look for a Kiosk in your area too CLICK HERE. Sounds great! I love anything and everything that helps organizing pictures or turning them into something else. Very cool! HI! I love photo kiosks, except when someone in front of you can't figure it out, and hold you up for ages! You are what you eat...see! I'm a mom and wife. Oy! Isn't that enough? Not for me. Originally from Hopewell Junction, NY, I ended up in CA back in 1983. 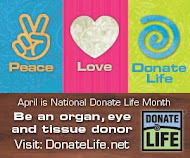 My husband Duane, my son Jonathan and my 2 step daughters, Alyssa and Emily are my world. I am a co-activities person for the local Boy Scout toop Jonathan is in and I am the 1st VP and Commutations person for the High School Band Boosters. Alyssa is in Color Guard. I love the community I live in. It's a small town and just a beautiful place to live.